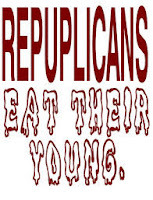 The speakership will destroy any Republican who takes the job. Because the Tea Party wing of the Republican Party will never compromise on anything. Witness the scribbling of North Carolina Tea Party blogger Brant Clifton.